Beautiful large balcony overlooking Lake Erie and Cedar Point, read my reviews!! Waterfront First Floor Chesapeake Lofts Condominium with beautiful view of Sandusky Bay, Lake Erie and Cedar Point. Call now to get the dates you want for a great deal. I want to fill my calendar! This unit is the closest one to the pool. It has a large enclosed patio which overlooks Cedar Point and Lake Erie and has amazing views of beautiful sunrises and evening fireworks at Cedar Point. The condo is well equipped with everything you will need to make your stay enjoyable. This includes a well stocked kitchen, high-speed internet,DVD player, flat screen TVs in both the living room and the bedroom. The docks for the Jet Express and Goodtime ferry boats - your ticket over to the Lake Erie Islands - are located right outside your door. The Jet Express is now stopping at Cedar Point, so no more driving to Cedar Point. Just walk across the parking lot and hop on the Jet. How easy is that???? This unit is located within steps of the large heated pool with hot tub and grilling area. The condo is an easy walk to local restaurants, shops, museums, parks and a downtown theater. A new marina with transient boat docks is adjacent to the condo . There is also a dockside cafe with a wonderful view of the lake. There is a large well-equipped exercise facility with large screen TVs just down the hall from your unit. Listed by the National Register of Historic Places, the building was a paper factory that was recently converted to condominiums. Located directly on Lake Erie, each unit is unique with the original brick walls, high ceilings and exposed pillars. Your patio is the old loading dock for the paper factory. This condo is the perfect choice for your next relaxing getaway or fun family vacation! Call today for more information on the condo, Cedar Point or the Sandusky area. We will be happy to answer any questions and are eager to make your visit as perfect as possible. We both love to travel and have a good idea of what guests want when they rent our condo. We take a lot of pride in taking care of the condo and hosting happy guests. I think we have done a good job of this, read our many reviews. We love the Chesapeake. Obviously it is a lot of fun in the summer, but we were surprised how much we enjoy the winters. The lake is absolutely beautiful when it freezes. And we just go down the hall and across the street to the restaurants and bars. We appreciate the short walk in the winters! Our guests are so happy when they see the condo for the first time. I enjoy meeting my guests and assisting them with their vacation in any way I can. We love the lake and have docked our boat down the street for years. I love meeting new people and helping them enjoy the Chesapeake as much as I do. The view, the view, the view!!! We have a large patio that overlooks Lake Erie and Cedar Point. 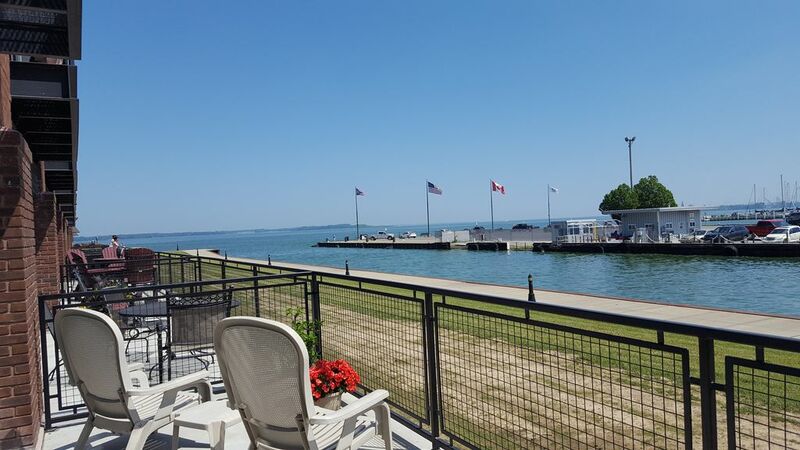 Everyone loves the patio and its views..... Location-the ferries to the Lake Erie Islands are across the parking lot to the east. On the west side of the parking lot is a new marina with an amphitheater and a darling Dockside restaurant. Downtown Sandusky is a 3 minute walk-enjoy the many restaurants, shops, and parks. The pool-we are the closest unit to the pool. Cedar Point-we are minutes away from Cedar Point. Relax-there are many things to do in the area, but this is a beautiful place to do nothing but enjoy the lake. Free advice-I live here too so I can give you all the advice you need to enjoy your stay here. I want you to love the Chesapeake as much as I do. One block away from downtown Sandusky with all its cute bars, restaurants and shops. Sandusky State Theater is 2 blocks away. View of Lake Erie and Cedar Point, including Cedar Point fireworks every evening. You will love sitting out on the large patio overlooking the lake! There is a dining table with 4 chairs and a kitchen island with 2 stools. I have left several books for my guests. There is a ping pong table in the fitness room. I have several games for my guests. There is a beautiful pool with many lounge chairs. There is a new marina on the west side of the building with dockside dining. There is also an amphitheater across the parking lot. Perfect location for everything fun in Sandusky and a really great condo/building. Owner was very communicative and helpful before, during, and after the trip. I rented the condo for my son and his girlfriend who were on leave. This place was perfect as it was close to the sites downtown, and far enough away from his family. Place was very clean and well taken care of. Owners were very amenable to my needs. Would definitely recommend this condo to future guests. The condo was very nice and clean. Everything we needed was there. Only suggestions I have is a bigger bed and bigger tv’s. But even without those upgrades I would return! My husband & I thought the condo was great. It had everything we wanted. The kitchen had everything we needed. The layout was perfect for the two of us. Patio was wonderful with a great view!! Location was great...we did utilize the Jet Express which is right there! Pool is beautiful. We really enjoyed Dockside bar. Thanks Kim!!! We will recommend. Very urban style, upscale place near downtown. Immaculately clean. Host was extremely accommodating and allowed us to make a last minute change to the dates of our stay which was much appreciated. The patios on the first floor units are nice sized, upper floor balconies are very small. Large bathroom, nice linens, comfortable mattress. This condo is located in a nice spot in the building, very near building entrance doors and pool. Pool, hot tub, workout room all very fine. We took our boat; there is no trailer parking allowed on the property, but we made arrangements with nearby Deep Water Marina to park there and the Shelby Street Public Boat Launch was just fine. Perfect boating days on Sandusky Bay. We liked Port Sandusky Family Restaurant for breakfast. Dockside Cafe is a nice outside waterfront bar. Many restaurants within walking distance, although since it is a downtown location, choices were a bit more limited in the evenings. Very nice stay. We are looking forward to a return visit. Lovely property with a great location. Kim was a gracious host! She covered the rental details thoroughly and had great suggestions on places to eat and go see. The condo was in a central location, so it was easy to find our way around. It was especially convenient for our trip to Cedar Point. We will definitely be back to visit and stay longer! The ferry to the Lake Erie Islands is across the parking lot. The Jet Express is now stopping at Cedar Point during the summer. So no more driving to Cedar Point, walk across the parking lot and hop on the ferry! I always recommend my guests visit the islands. Kellys Island is larger and more quiet. Put In Bay is quite busy on the weekends, but quieter during the week. I recommend seeing both if you have never been here before. The Jet Express is a quick, easy way to get to the islands, and best of all, no drive home! The condo is right across the parking lot. Cedar Point is visible from the balcony, again, most of my guests visit Cedar Point. Downtown Sandusky is one block away, with it's many nice restaurants, bars and shops. I love the Small City Taphouse and Crush. Many guests enjoy the speakeasy down the street, Vostead. And you can't beat the Dockside Cafe at the marina to the left of the condo. Online booking automatically adds 4-9% to the quoted rate .